Until recently, The Orleans Parish District Attorney's Office sent notices like this that threatened jail time if people don't come in for questioning. But they weren't not legal documents because they weren't authorized by a judge. A new federal lawsuit alleges the practice was widespread and violated people's constitutional rights. In defending the use of fake subpoenas that threatened fines and jail, Orleans Parish District Attorney Leon Cannizzaro said he doesn’t know of anyone who’s been locked up for ignoring one. That’s not for lack of trying. In January, a prosecutor sought to arrest a victim of alleged domestic violence in part because she had failed to obey a fake subpoena. A judge issued the arrest warrant, but she soon recalled it after the DA’s office decided to drop charges against the victim’s ex-boyfriend. In an interview, Cannizzaro acknowledged his office issued the fake subpoena and the prosecutor cited it when seeking the arrest warrant. He defended those actions, noting that the victim had gone to police twice but had stopped cooperating with prosecutors. An expert in prosecutorial misconduct has said it’s improper for prosecutors to mislead people by sending them fake subpoenas. Obtaining an arrest warrant based partly on a fake subpoena “raises the level of misconduct,” said Bennett Gershman, a Pace University law professor. The day The Lens reported on the use of fake subpoenas, Cannizzaro’s office announced it would stop. The notices sent by Cannizzaro’s office threatened fines and imprisonment if people didn’t show up for questioning. But they were not authorized by a judge or issued by the Clerk of Court, as the law requires. Those were empty threats — or so it appeared until we saw an arrest warrant in a file at the courthouse. James Cunningham, an officer with the New Orleans Police Department, was arrested twice in 2015 on allegations of domestic violence. In January 2015, Cunningham’s girlfriend said he kicked in her door and injured her as she fought him off, according to a police report. In August 2015, he allegedly grabbed her and stopped her from leaving her house, according to NOLA.com/The Times-Picayune. Cunningham was charged with home invasion, domestic abuse battery and false imprisonment. The NOPD fired him in 2016. In January of this year, a prosecutor was preparing to take the cases to trial after several delays. But the victim wasn’t cooperating. She didn’t respond to a subpoena to appear at a trial on Jan. 25, according to a court filing by Assistant District Attorney William Dieters. The victim declined to comment for this story. The Lens has decided not to identify her because of the nature of the charges. The clerk’s office had issued a subpoena — a real one — to the victim for that trial. It was delivered by a sheriff’s deputy the day after Christmas. However, the deputy left the trial subpoena at her door. That’s not considered proper service under state law. Cannizzaro acknowledged that. He said deputies typically try several times to serve subpoenas properly before they leave them at someone’s door, though he’s not sure if that happened in this case. Phil Stelly, spokesman for the Orleans Parish Sheriff’s Office, said in a written statement that deputies “make every effort” to serve court papers to the people named or someone who lives with them. The trial was rescheduled for Jan. 27. In the meantime, according to Dieters, a victim counselor with the DA’s office called the woman several times. She didn’t answer. So the DA’s office tried another subpoena. That document summoning her on Jan. 27 is identical to the fake subpoenas The Lens has found in other cases. The victim received it Jan. 26, according to a court filing by the victim’s attorney, Anthony Ibert. 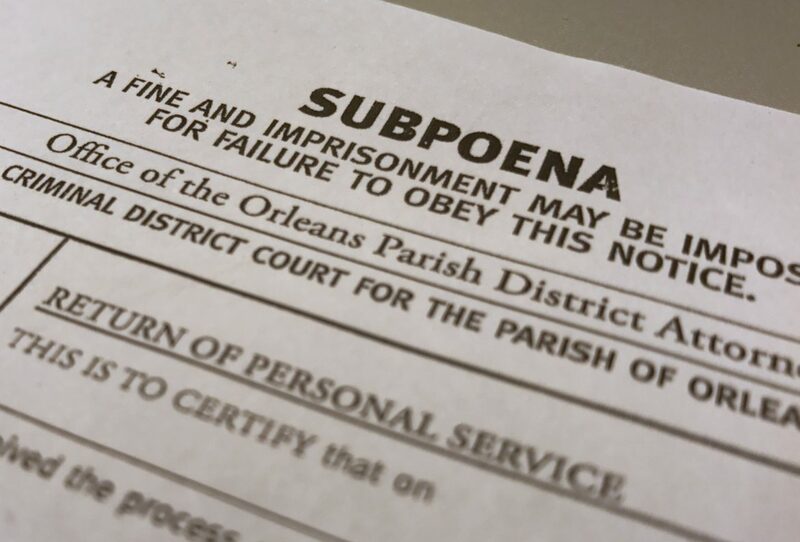 Like other fake subpoenas sent by the Orleans DA’s office, the notice threatened punishment if it was ignored and purported to have been authorized by a specific part of state law. Cannizzaro’s office would have been authorized to deliver a real subpoena ordering the victim to appear at the rescheduled trial. Cannizzaro said Dieters decided to use the fake one — the office calls them “DA subpoenas” — because he needed the victim to come to the DA’s office to prepare her first. Dieters asked Criminal District Court Judge Laurie White to issue an arrest warrant for the victim with a $50,000 bond. That’s called a material witness bond. The DA’s office can use them to jail reluctant witnesses until they testify. To get one, a prosecutor has to demonstrate that the witness is essential to a case and that it may be too difficult to get the person to show up in court with a subpoena. Cannizzaro’s office has been criticized for jailing witnesses and victims. In April, the watchdog group Court Watch NOLA identified 30 arrest warrants sought by his office for victims and witnesses in 2016. Cannizzaro said his office does that as a last resort. In this case, he said, Cunningham had allegedly attacked the victim twice. Cunningham was a police officer, and Cannizzaro said the prosecutor didn’t want Cunningham to intimidate the woman into abandoning her case. Dieters’ request to arrest the victim did not offer the subpoena itself as evidence. Instead, he provided a printout from the court’s electronic witness roster, which should only include records of genuine subpoenas. According to a court filing by Ibert, the victim’s lawyer, the victim only received a fake subpoena for Jan. 27. The computer system has an entry for a Jan. 27 subpoena. But the court clerk’s office has no corresponding record of a genuine subpoena or a return, which is what a deputy or an investigator brings back to the clerk’s office to demonstrate a subpoena was served. Clerk of Criminal Court Arthur Morrell said the DA’s office should have records of the subpoena and the return. The Lens has submitted a public records request for them. White initially granted Dieters’ request, signing an order to arrest the victim. Cannizzaro said that according to Dieters, White knew the “subpoena” cited in his motion was invalid. But she granted the order, Cannizzaro said, because Dieters described the repeated efforts to reach the victim. “The judge made a statement on the record that the DA subpoena, it’s not a valid subpoena. It’s not an Article 66 subpoena,” Cannizzaro said, referring to the part of state law that spells out how prosecutors can force people to come talk to them. “Of course I would never issue a warrant for any victim based on a fake subpoena,” she said in an interview. The Lens was not immediately able to obtain a transcript of the hearing. After that, Dieters asked to reschedule the case. White refused, saying it had been delayed too many times, according to a clerk’s notes in the court file. So the DA’s office decided to drop the charges against Cunningham, and White recalled the order granting the arrest warrant, according to the clerk’s notes. The judge then considered Ibert’s motion to throw out the fake subpoena and the arrest warrant for his client. But the issue was moot because she had already recalled the warrant. Ibert’s motion included a copy of the fake subpoena and described why it was invalid. He wrote that his client had received “what appears to be an Art. 66 subpoena” from a neighbor who lives in the same apartment building. Under Article 66 of the Code of Criminal Procedure, a prosecutor must ask a judge in writing and explain why he needs to speak with the person. If the judge approves the request, the Clerk of Court issues the subpoena. None of that happened, Ibert wrote. Moreover, he wrote, his client never received anything telling her to appear for a trial on Jan. 27. He declined comment for this story because he didn’t have permission from his client to discuss the case. The woman had told the DA’s office that she didn’t want to pursue charges against Cunningham, Ibert wrote. “She has been told that she will be jailed if she does not cooperate without being told what entails cooperation,” he wrote. ‘No legal consequences’ for fake subpoenas? The DA’s office has discontinued the practice of sending fake subpoenas. In an interview on WWL-TV, Cannizzaro said they were improper but characterized them as relatively harmless. “There are no legal consequences for the person who is the subject of that notice if they do not show up,” he said. Gershman, the expert in prosecutorial misconduct, took issue with that. Until he saw this court file, Gershman said, it appeared prosecutors were just trying to bully witnesses. “Now they’re asking a judge to issue an arrest warrant based in part on a fake subpoena,” he said. Loyola University Law Professor Dane Ciolino, a legal ethics expert, said prosecutors seeking a material witness bond can give any reason for believing the person won’t show up in court. If a witness ignores a subpoena, doesn’t answer phone calls from the DA’s office or simply says he won’t show up, that’s all relevant. “It’s really up to the judge to evaluate whether that’s sufficient evidence,” he said. But everything in the motion has to be true. Referring to a fake subpoena as a “subpoena” in a motion is not OK, he said.